Friday was a hot and humid day so we headed over to the Ocean Club in Puerto Banus for an al fresco lunch hoping to catch a bit of a sea breeze. We had spent a long day in early July lounging in one of their sun beds and had a fantastic Thai meal. We were hoping that this time around the food would be as good especially after the bad meal we had the night before. We shared plates all around and had chicken and prawn satay, spring rolls, prawn cakes, fried wontons followed by prawn Pad Thai, rice noodles with spicy beef, Thai beef salad and a green shrimp curry. 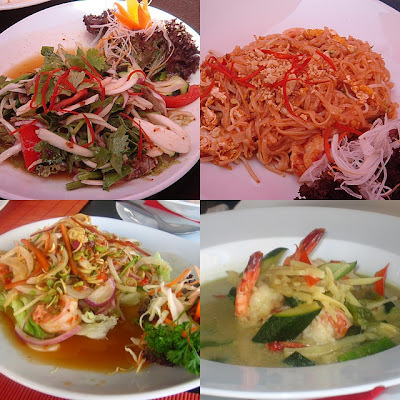 We weren’t disappointed – the food was as good as the last time – authentic Thai food in the middle of Marbella. The service was surprisingly efficient despite the place being packed. The area around the pool was heaving with people lounging around, having drinks and worshipping the sun while the restaurant was filled with large groups of families and friends having lunch. We escaped back home right after lunch to sit in the shade and take a nap after our delicious meal. Thanks Nay! I’m finally putting my “travel black book” out there for everyone to use. So, when are we doing another trip to Paris? Thanks Cooking Ninja! The Thai food at the Ocean Club was very good. Thanks Liz! Marbella is where I live – just list me as Gourmet Traveller.R.